Introducing The Rain Ponchos Packs For Adults By Wealers! With 2 high value packs of 5 or 10 rain ponchos for you to choose from, each pack boasts a large variety of different colored ponchos individually packed in a 4” x 6” poly bag that fits virtually anywhere! As opposed to an umbrella, our rain poncho is lightweight (45g) and designed to be traveller and commuter friendly as it takes up minimal bag space. Easily store one in your luggage, purse, backpack or pocket and be prepared for sudden showers. Extra-long and one-size-fits-all, our emergency ponchos not only keep you and your clothes dry, but also your backpacks, totes and bags, making them perfect for camping, cycling, tailgating and more! Perfect for amusement / theme parks and all your Disney World endeavors as you can also wear them on water rides and avoid getting soaked through. 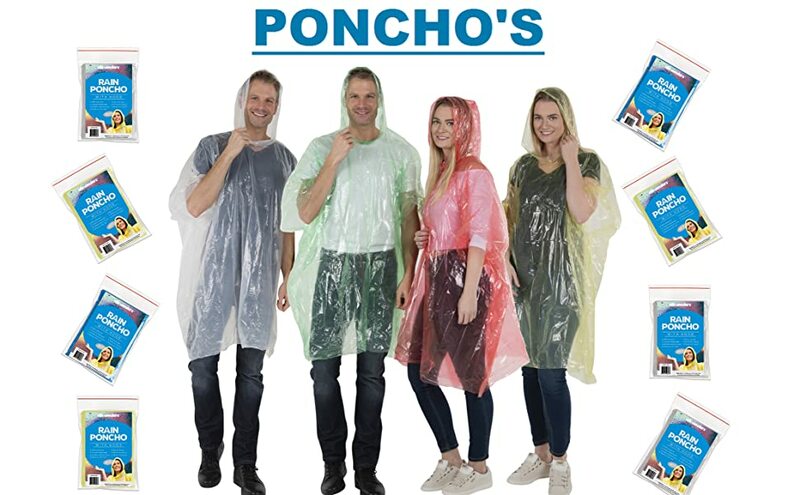 RAIN WILL NEVER SPOIL YOUR FUN AGAIN: Offering you 2 high value packs of 5 or 10 rain ponchos for you to choose from and boasting a large variety of different color assortments, each poncho features a hood and roomy size of 50 x 40inches for supreme coverage. Lightweight, packable and perfect to have on hand for pop up storms and sudden showers, you won’t have to interrupt your outdoor fun as they’ll effectively keep you dry and dirt free! BETTER THAN AN UMBRELLA: No need to carry around a bulky umbrella with our emergency ponchos! Manufactured for efficiency and to be commuter friendly, each lightweight and highly portable poncho comes individually packed in a 4” x 6” poly bag that fits virtually anywhere - pocket, purse, backpack and more! As opposed to an umbrella, wearing our waterproof poncho means your clothes will be covered and your hands will be free to do whatever you want!